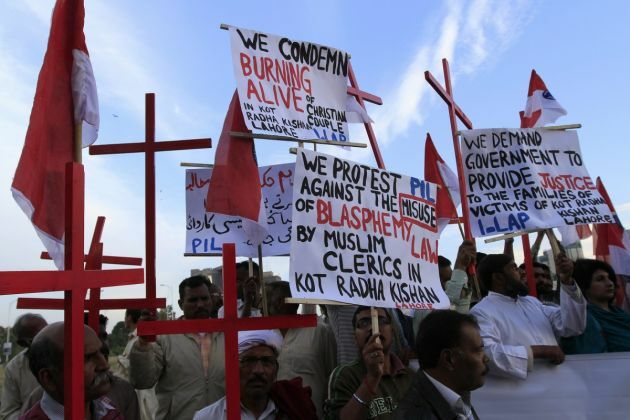 (Photo: REUTERS / Faisal Mahmood)Members of the Pakistani Christian community hold placards and wooden crosses during a demonstration to condemn the death of a Christian couple in a village in Punjab province on Tuesday, in Islamabad November 5, 2014. Police in Pakistan arrested dozens of people after a mob beat a Christian couple to death and burned their bodies for allegedly desecrating a Quran. A UK all party report has called for new guidelines recognizing Pakistani Christians as genuine asylum seekers after finding that they along with Ahmadis and Hindus face a real risk of persecution. "Pakistan presents a particularly bleak environment for individuals wishing to manifest their right to freedom of religion or belief," contends the report by the All Party Parliamentary Group for International Freedom of Religion or Belief. The report on the UK Department for International Development to ensure that overseas aid is only provided to organizations and government departments in Pakistan that protect international human rights obligations, including freedom of religion. The Feb. 24 report was released at a time the UK government has bowed to media pressure to accept tens of thousands more Muslim migrants from Syria, but continues to ignore the plight of Christians in Pakistan, Breitbart News Network reported. Some 96 percent of Pakistan's 199 million people are Muslim, and the report details how Hindus, Sikhs, Christians and other "non-Muslim" groups face violence from extremists as-well as "State sanctioned" subordination. This is imposed in punitive blasphemy laws, political underrepresentation and the "Islamisation" of institutions. The report directly challenges Home Office's Guidance about Pakistani Christians and Christian converts, stating that, "a new country guidance case regarding Pakistani Christians is urgently required to provide sufficient guidance for Pakistani Christian asylum cases." Lord Alton, Vice-Chair of the cross party group who is a Catholic, spoke on in introducing the report at the House of Lords, the upper chamber of the UK parliament. "The official line of the UK Government is that there is no persecution [of religious minorities], the reality is the opposite of that and our report dispenses with that illusion," he said. Alton noted, "Pakistan is the biggest recipient of British aid - more than 1 billion British pounds ($1.4 billion) in the last couple of years - and we should be demanding that British aid is used to protect minorities and to staunch the flow of refugees."